Your dream wedding made real! 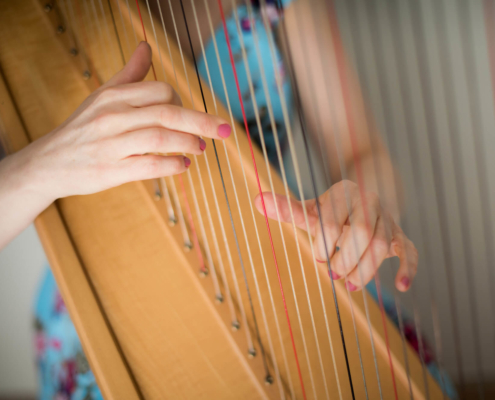 The romantic sound of the harp will add a touch of magic to your wedding day. Taking up just a small space with such a wonderful, relaxing sound, listening to the harp is an elegant, emotional experience. A favourite song played during the signing of the register can make the ceremony extra special and personal to you both. The ambient and soothing strings are an excellent accompaniment to the drinks reception or wedding breakfast. Its gentle sounds carry across a room without intruding on conversation. And it can even be moved outside! 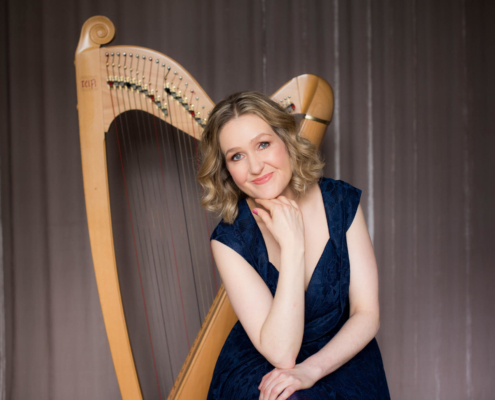 Bethan is not only an award-winning harpist but a professional singer and as an added extra can sing your favourite song to the accompaniment of her harp, either during the bridal entrance or while you are signing the register. She sings in both Welsh and English. Bethan has excellent quality amplification to ensure the music can be heard over the chatter of guests. 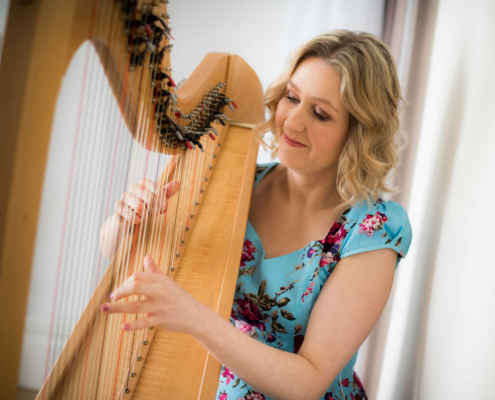 An experienced welsh wedding harpist with over 10 years’ experience, Bethan’s repertoire contains a wide variety of music – traditional, classical, Celtic, contemporary and popular. Up to 30 mins of music to welcome the guests to the ceremony and to calm nerves! Music with a modern touch as you and your guests relax with your drinks and have your photographs taken. Bethan provides a consultation to advise on musical selections. Just to say a massive thanks for your performance on Saturday. It was fantastic, Ryan was over the moon. A few people thought a CD was playing when you sang. When I told them it was you they were amazed! You have such an ability to play the harp and a truly amazing voice. You were commented on by everyone! Thank you so much for contributing to Paul and Kate’s wedding day at Llancaiach Fawr. You played beautifully and your singing was fantastic. You made the day extra special. I can’t praise you enough! Just wanted to say a massive thank you for playing at our wedding at Clearwell Castle. Everyone commented on the beautiful music and how friendly you were. Thank you so much for your time with us, you were amazing and everyone loved the music. Your voice was phenomenal! Bethan made our wedding the special occasion that we had hoped for. Her talented playing and beautiful singing produced lots of positive comments from guests. You really are very talented and we are very grateful to you for agreeing to come and play at our wedding.